Post news Report RSS	Alpha 0.5.11 released! Alpha 0.5.11 released. Important features: currency, NPC vendors, NPC triggered actions, default world updates, a new crafting discipline, new items, recipes, and bug fixes. Alpha 0.5.11 released. Important features: currency, NPC vendors, NPC triggered actions, default campaign updates, a new crafting discipline, new items, recipes, and bug fixes. Thanks so much to all the people who have so far aided in the alpha testing and development of the game. Your efforts have been invaluable! Currency is now available in Lugdunon! Implemented as a subsystem to allow for server admins to replace the default implementation, which uses gold, silver, and copper, with another of their choosing. Any instanced item can now have a 'worth' assigned to it, and will show in the item's tooltip. 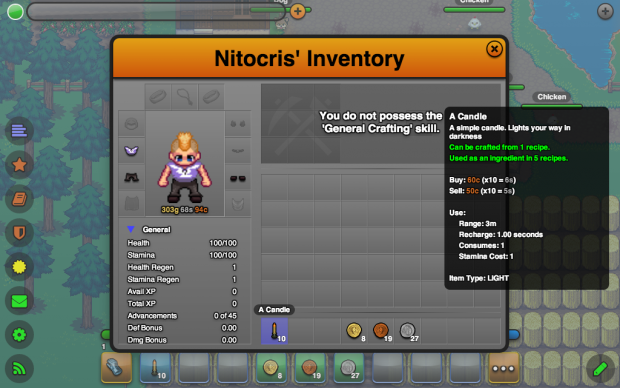 A player's current 'purse' is displayed at the bottom of their character portrait on the inventory dialog. It is now also possible to award currency for the slaying of NPCs and the completing of quests! 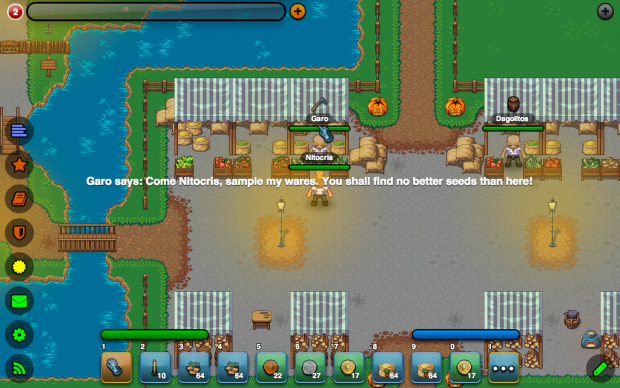 Vendors also finally make their appearance in Lugdunon with the release of 0.5.11. 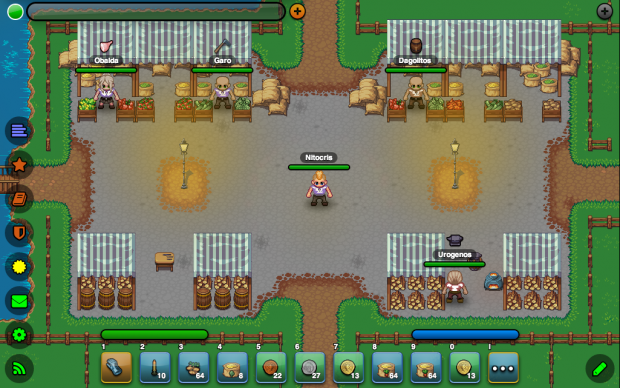 Building off the newly introduced currency system, vendors offer an alternative method to acquiring items. There is a standard vendor markup on all items that can be specified by server admin. Vendors will also purchase from you any unwanted items, so long as they are instanced and of worth. A small pool of previously vendored items is retained in the event that you wish to repurchase an item that was vendored in error. Keep in mind that there is limited space available in this pool, and older items will be deleted permanently. Also, buyback is subject to the same vendor markup as purchasing new items. The are a maximum of 255 slots available to a single vendor. Slot types can be extended by modders, with a simple slot and a slot with a configurable 'restocking time' provided by default. NPCs can now trigger actions through the use of newly implemented proximity trigger behavior and dialogue response objects. This allows, for instance, vendors and other NPCS to call out to players when they venture into the desired range, and for dialogue responses to warp a player to another location. The Bibracte market square is now home to four new vendors, a town guard casts his watchful gaze down the road leading out of Bibracte to the south, signs now have words to be read, and a small foundry has been added to the family farm. Zombies now drop currency when slain, and each of the quests in the family farm quest chain now award currency on completion. A new crafting discipline has been added in conjunction with the appearance of currency: Goldsmithing. Goldsmiths will be able to use their skills to turn precious metals and gems in to jewelry, and even cast coin! As part of the gold, silver, copper currency implementation, players can cast coins using a craftable coin blank and sand mold. Coins crafted in this manner, can be placed in the action bar and 'used' to add the coin to your player's purse. Two new craftable houses (timber, and limestone), a goldsmith's bench, silver ore nodes, silver ore, and silver bars, have also been added to the default assets, along with all the appropriate crafting recipes. Finally, a special thanks to Marxell for helping me test various aspects of running a custom server. In the process he uncovered a fairly serious issue with the server while using composite classpaths under windows, which has now been rectified. As always, the full change log for 0.5.11 is available here.